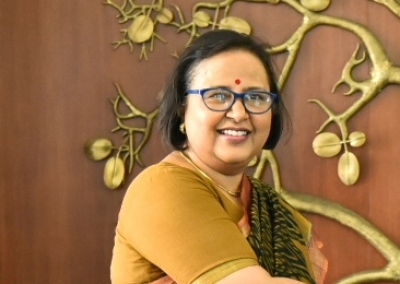 New Delhi Sep 14 (IANS) India and the European Union (EU) should find new and innovative ways to move ahead with negotiations for a free trade agreement (FTA) they are engaged in the Secretary (West) in the External Affairs Ministry Ruchi Ghanashyam has said. "The Broad-based Trade and Investment Agreement (BTIA) is an example where both sides need to find new and innovative ways of moving ahead " Ghanashyam said while delivering the keynote address at a symposium on "EU and India -- Partners for stability in a new international environment" here on Thursday evening. "Effective standards that are helpful in engaging industry and protecting consumer interests should not raise new trade walls " she said. Negotiations for the BTIA started in 2007 but were put on hold in 2015. In all 16 rounds of negotiations have been held. Those in the know say that after India renounced its bilateral investment treaties (BITs) with all countries investments from European nations are now not protected. Ghanashyam said India was an open society with a strong rule of law that provides adequate protection to foreign investors. "India s FDI regime has addressed most demands of the EU even before investment negotiations had commenced " she said. "The government through its reform-oriented agenda is placing heavy emphasis on performance to bring about transformational changes in the country." Stating that over 1 200 archaic laws that affected business governments and day-to-day life of the common man have been repealed Ghanashyam said India s flagship programmes in the areas of manufacturing digitisation skills financial inclusion urbanisation start-ups infrastructure in energy and transportation were driving economic growth. "The unprecedented roll-out of the Goods and Services Tax (GST) in July 2017 has resulted in making India a single market very much like the EU and has thrown up multiple business opportunities to European businesses " she stated. Describing India and the EU as "natural partners" she said that in the last two years engagements between the two sides have substantially increased. "There are over 30 dialogue mechanisms between India and the EU " Ghanashyam said. "The EU is one of India s largest trading partners." EU Ambassador to India Tomasz Kozlowski said that Thursday s symposium coincided with the start of the political autumn season in Europe and that the EU planned to adopt a new strategy for relations with India. The bloc will publish an EU strategy on connecting Europe and Asia.